Schola Cantorum is Oxford University’s longest running chamber choir. Since its foundation as The Collegium Musicum Oxoniense in 1960 by László Heltay, the choir’s commitment to the development of young talent has been evidenced by the large number of former singers who have gone on to a professional career, including Emma Kirkby, Ian Bostridge, Jane Glover, Laurence Cummings and Christine Rice. Schola’s continual success stems from a long line of eminent conductors including Andrew Parrott, Nicholas Cleobury, Ivor Bolton, Jeremy Summerly and James Burton. It was in 1964, under the direction of John Byrt, that the choir acquired its current name, Schola Cantorum. 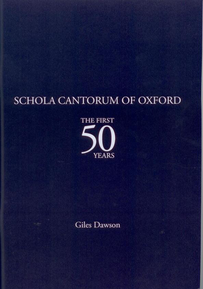 The choir and trustees would like to express our immense gratitude to Mr Robert Charlesworth for his generous support in the publication of Giles Dawson’s history of the choir, Schola Cantorum of Oxford: the First 50 Years, an extract from which can be read below. The book is an informal narrative history of the choir from its earliest days up to and beyond 2010’s reunion concert, including many amusing anecdotes and accounts of tours, concerts and recordings. It all began in Oxford, one spring day in 1960. There were only two months to go until the Concorso Polifonico of that year in Arezzo, Italy. A handful of keen singers had gathered in the rooms of László Heltay, graduate music student of Merton College, in Rose Lane. One of those singers, Michael Raeburn, remembers the conversation turning towards Arezzo, and whether there was any chance of these young enthusiasts forming a choir to enter the competition. History relates that, under the portentous banner of COLLEGIUM MUSICUM OXONIENSE, they swiftly got their act together – even managing to arrange several warm-up concerts in Cambridge, Eastbourne and elsewhere, so as to learn repertoire and develop a convincing ensemble. CMO was re-born in 1964 under a new name when László went overseas, and has enjoyed (so far) a further 49 years of outstanding music-making as SCHOLA CANTORUM OF OXFORD. This is the organisation which has given hundreds of young people their first taste of top-quality chamber choir singing; has provided a launch-pad for a succession of gifted conductors and singers; has toured all over the world (recently to countries hardly before visited by British musicians); and has produced an impressive list of recordings which bear eternal witness to the consistent ability – often brilliance - of this ever-changing ensemble. Each conductor has brought different qualities and indeed repertoire to the choir. Raeburn recalls László Heltay as a musician who instilled a level of accuracy and sophistication which was unheard-of in student or amateur circles at the time. “We had to sing in Hungarian on the very first tour,” recalls Michael. "László complained of us sounding like the denizens of some ill-favoured Budapest suburb…” Later incarnations of CMO/Schola have dared to sing in German to Germans, in Chinese in China, in ancient Polish dialects to Poles, and in Spanish (with a Mexican accent) in Mexico! "There is no better choir to sing with for building experience as both a singer and a musician - great music, great conducting and great people. What more could you want from a choir?"